MDC OnBoard: Meeting of the Minds, Now Paperless! 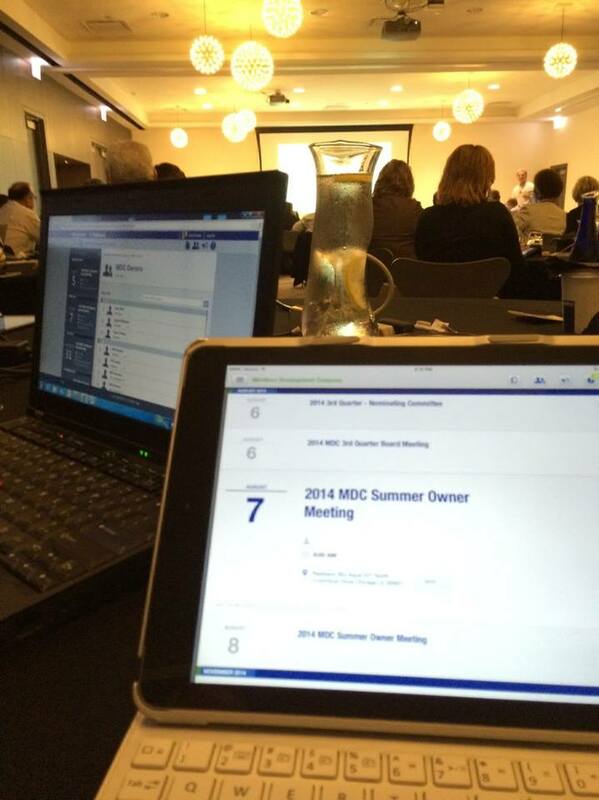 Members Development Company (MDC) extended Passageways OnBoard, a paperless meeting solution, to attendees of their August, 2014 semi-annual owners meeting in Chicago, IL. This meeting marks a first where MDC Owners were able to access all meeting presentations and materials electronically prior to, during and following the Owner Meeting. Approximately 90% of all MDC Owners are represented by at least one employee at each owners meeting. Even so, the number of attendees each owner can send is restricted by time and resource limitations. The significance of the research and data presented at any given meeting translates to fundamental value when shared with additional key employees following the meeting. Disseminating information collected in the paper book proved rather cumbersome, requiring attendees to scan and email segments from the agenda or physically sharing the compiled book. OnBoard grants electronic access to presentations that attendees can share with their team at any time. Further, past meeting materials can be accessed through OnBoard at any time establishing increased return and convenience to all MDC Owners. Furthermore, the content in these books is often slides with charts and graphs, which were difficult to discern. The convenience of the iPad’s ability to “pinch and zoom” negates this challenge, making the presentations easier for attendees to follow along. Previously, MDC spent over $7,000 each meeting on costs of printing, binding and shipping of paper books ranging between 250 – 400 pages. These paper books had only one-time use and often were not handy for any future reference. OnBoard has eliminated the cost of the paper books and reduced the ecological footprint on the planet. In addition to the high cost of the physical book, the executive team at MDC spent valuable time at the beginning of each meeting to incorporate last minute changes to presentation materials for attendees, time better spent engaging with owner attendees. Passageways understands the reality of last-minute addendums and corrections required for a large meeting. With OnBoard, MDC was able to keep the most up to date and relevant information in the hands of their owners at all times. The real-time updates allowed for an increased amount of flexibility contributing to a tremendously successful meeting. Paroon Chadha, CEO – Passageways, was at this MDC meeting and noted, “OnBoard was great from a cost savings and efficiency perspective. It also was ideal for those credit unions that were already using OnBoard for their own boards such as Amy Sink, CEO, Interra Credit Union. Amy can now get her board information and MDC meetings information all from one familiar environment”. Members Development Company (MDC) is a cooperative organization owned by some of the top credit unions in the country. MDC has created a partnership between some of the largest and most progressive credit unions, corporate, leagues and CUNA Mutual to explore ideas and help them stay competitive. These 39 owners represent almost $80 billion in assets and more than 5.5 million members. MDC owners actively engage with one another to discuss products, strategies, and overall market trends and prioritize R&D projects for MDC to manage collectively.